Dateline: 1683 to 1700, Pennsylvania and West Jersey. The head of household served in the highest level of government of the Province of Pennsylvania, but his own really bad behavior brought him down. Comments are inserted after the dates, to introduce the main issues. Drunk and disorderly. Not a good beginning for Councilman John Richardson in the fledgling government. Council: William Penn, Proprietor and Governor of Pennsylvania and counties annexed. Capt. Wm. Markham, John Simcox, Wm Clarke, Capt. Thos. Holmes, James Harrison, John Moll, Capt. Edmund Cantwell, John Hilliard, Wm. Clayton, Ralph Withers, John Richardson, Francis Whitwell, Christopher Taylor. Here the Council replace John Richardson in Kent County, which belonged to Philadelphia at that time, but is now in Delaware. His sister was a murderess. Upon the reading of the petition of John Richardson, in behalf of his sister Judith Roe, who had sentence of death passed upon her the beginning of this month, in a provincial court held in Kent County, humbly beseeching that the governor would be pleased to grant to said Judith Roe a reprieve. Let’s continue the storyline about his sister. It appeared to be granted upon the petition of John Richardson, brother to the murderer, which petition was read. It appeared also that a sentence of death had passed upon her in a provincial court held in the County of Kent, where the fact was committed and that the said provincial court was duly authorized by the then President and Council by commission under the lesser seal, dated 2 April 1687. She was executed, probably by hanging, on March 15, 1689 (our dating). The earliest Quakers believed in the death penalty. Anyone want to find the court record in Kent County, Delaware? Look for her case in April 1687. Records for his misbehavior don’t pop up until seven years later, but it is a sure thing he did misbehave, between 1683 and this next record. It is not clear (to me) that Samuel and John are related, but they probably are. On the above date, it was reported that he beat his wife within an inch of her life. Councilmen: Samuel Richardson, Griffin Owen, Bartholomew Coppock, Griffith Jones, Johannes D’Hayes, William Stockdale, John Brinkloe, John Curtis, Arthur Cook, John Simcock, Luke Watson, Thomas Duckett, William Clark, William Markham, Secretary. Now John Sr.’s misbehavior works its way down to his son John Jr. and prevents him from getting a license for an Ordinary. The family brought the refusal on itself. Finally, we get some resolution—maybe. He has been subjected to an attainder. This law survived from the Medieval Age and was done by parliament, in this case the Pennsylvania Council, often without trial. It means “corruption of blood.” That is, a man behaves so badly that the law and especially the law of inheritance do not apply to him. In this case the Council removed his land and rights, and his heirs could not inherit. At least we now know Richardson is dead. How to remove the attainder? At which time Griffith Jones, in behalf of _____ [sic] Richardson, son of John Richardson of the County of Kent, decd., brought a draft of a bill for taking off the attainder of the said John Richardson, decd. and the said Griffith Jones, having been heard how he could make good the reasons of his request in said bill contained; the Governor [William Penn is in town now] and Council, after perusal thereof, committed the further perusal of the same to Thomas Story and ordered him to report the reasonableness thereof tomorrow. We don’t get resolution. William Penn himself presided over this Council meeting. At a Council held at New Castle, Sabbath Day, 2nd Nov 1700. Thomas Story gave [handed] in to the Governor and Council the Bill for taking off the attainder aforesaid, with amendments, which was read and debated. I can’t find how things worked out. Was the attainder lifted? Maybe another record will tell us. Incidentally, the councilmen worked on the Sabbath–Saturday. 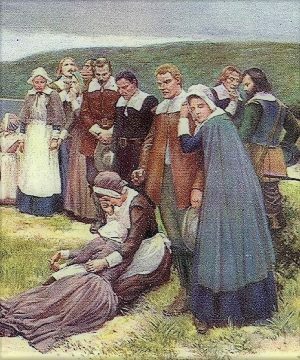 Was She the First Murderess in New World America? This entry was posted in Pennsylvania History and tagged crime and punishment in colonial Philadelphia, Early Philadelphia history, early Quaker history, Early Quakers believed in death penalty by james malcolm. Bookmark the permalink. I have a Luke Watson in my tree but was under the impression he came from VA and ended up in Sussex County DE. Will have to verify this later after I get back from vacation. Luke Watson figures prominently in the Minutes of the Provincial Council. I’m amazed that he traveled from VA to PA.